You have finally graduated. It is on to the Career Path. Bearing in mind that you have 50/50 chance to succeed or fail, with all the faith you can muster, you sell your skills to the world. But years later, the world still does not respond to your services. You try all you can to make sure your skills are on the radar but it doesn't care about your talents. No matter how much you pitch your strengths, it seems that the world isn’t given you any audience. Well here is the thing, The world thinks that you are better off unemployed. Now why would the world feel that you don’t need a job? 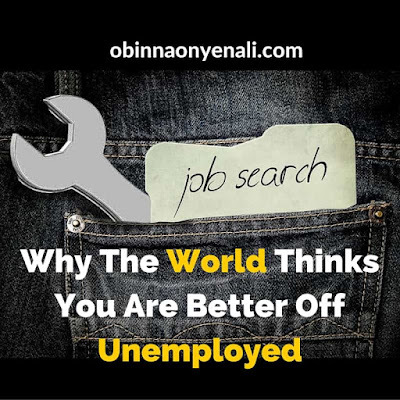 Why would the world believe that you are better off staying in the unemployment circle? There was a time when it was so easy to get a job. You finished from the university, graduated and there was your job waiting for you with beaming smiles. It was easy for the world to give out jobs and the adage “Go to School and Get a Job” was the popular wisdom; in fact the world promoted this slogan. It was confident to give you a job. However, after much innovation, economic reforms, revolution, evolution plus the rise in technology, the situation seems to be different. Jobs have become far-fetched for the job seeker. The world is trying so hard to keep its promise to give you a job with several policies and strategies, but alas it seems to be losing the war. You might be feeling that it is not your fault for not having a job. You must be cursing why the world would put you in a state of unemployment. You must be depressed that you can’t do anything about it. Turns out that you are not alone. So many job seekers are in pain wondering why the world would put them in a state of confusion. Why aren’t there campaigns for more jobs? Why are there so much downsizing among workforce? How come there is much corruption when there are so many unemployed youths? While these issues look valid, the world sees them as excuses which are affecting its progress. Now this is strange to the world; why do people hold on to excuses when right before them are so many Golden nuggets? Why do people fail to see these nuggets as dream jobs but easily see failure? Strange isn’t? Why do you feel that there is no Job opportunity? Do you believe that your situation has no solution or are you just holding on to Excuses? You are sure starving the world of inspiration. You are making the world lose its battle in being a better place without realizing it. It is easy to blame the world for your lack of a job. It looks good to point your finger at the world because it is sure not doing enough to make you have your dream a reality. But does the world really owe you anything? Does the world really owe you a living? Is the responsibility of the world to make your life so full of bliss or are you responsible for such life? Here is the thing If you knew how much you make a difference to the world, you would never hold on to its realities because it is through your realities that the realities of the world become profound. Indeed, no matter what you think or belief, the world is helpless without you. You shape the world in ways you have never imagined. Believing that you have no say in the world, is what is limiting you to the products of your Culture, Society and even Politics. This is why the world is saddened that you are given it the responsibility to make a difference in your life. It can never fulfil this goal because it is not equipped to do such. The world marvels why you can’t see your amazing gifts. It wonders why you seek its validation to prove you are worthy. In times of adversity – You must always choose to move forward. Progress is a choice. Job creation is a choice. Whether you move forward or back: this too is a choice. So what is your choice? Open your mind, expand your options, and create your own opportunities. Take a temporary contract. Volunteer, start your own business, make use of your connections, take advantage of your hobbies. No more excuses. Making positive changes in your outlook and mindset is very important. The world is full of problems that it can’t solve. It is only your unique skill set and experience that are needed to solve these problems. Think about this: Why is it that despite the abundance of Job unemployment, a few people still make a difference? What is that these set of pacesetters see that are not obvious to rest? You have a voice inside you that has the power to overcome all self-imposed standards and cause a transformation to the World. You are the power tool that shapes the world. It is time for you to take responsibility for your life. You have got so much to offer and so much skills that can make a difference. If the world can’t create a place for you to express your skills then you need to find a way to create one for yourself. Are you going to give the responsibility of your dream job to the world or are you going to take the initiative to create the job of your dreams? What do you think? Is the world justified to make you unemployed? Please share your comments below. This is a guest post by Ikechi Awazie. Ikechi Awazie is a Blogger, Content Strategy Expert, Social Media Consultant. Visit his blog, AwazieIkechi.com, to draw more from his vast pool of knowledge. You can also follow him on Twitter @ikechiawazie. Ike, yours are words spoken in due season. I’m happy you used this platform to inspire graduates and everyone tackling the challenge of unemployment in the country. More grease to your elbow. It's nice to be over at your blog as well, Obinna - my very first visit! Not knowing it was a guest post, as I read through, I felt it was like Ikechi's voice, and thought perhaps you knew each other, so tend to share similar thoughts and words. Not surprised to see Ikechi, as the guest here! You raised a wonderful topic of discussion, Ikechi, about unemployment, which is present all over I think. But as you mentioned, why blame people or the system, who will take their own sweet time to change. It's us, the people, who need to move ahead and make a difference to the world - we have to create, isn't it? You are right as you message comes out loud and clear - we all have the power to make a difference, only if we try. Many thanks, Harleena, for your thoughtful comments as well as visiting my blog for the first time :) Yes, Ike did justice to the topic, which I believe will inspire a lot of people to make most of their lives instead of looking for whom to blame. Once again, I appreciate your contribution. You really got me when you said you felt it was my voice. It shows how much I have honed my voice and it is all thanks to you Harleena and my awesome community, ABC. Thank you so much for the compliment and I am glad you like my post. Take care and have an awesome week.